This painting was in fragile condition as the canvas was very brittle with numerous small tears and holes. The painting was also covered by a thick hardened grime layer. 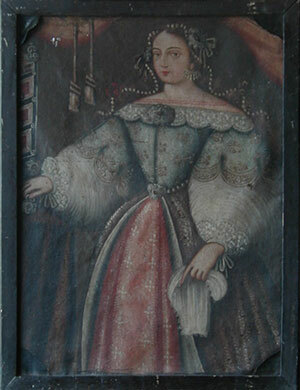 It is not uncommon to find old paintings with frames attached to the surface of the painting and that is what we find here. The individual slats of the frame were nailed directly into the surface and they covered original design. In addition, leather patches were attached to the surface of the painting in all four corners. The major part of this treatment was to recover the original dimensions and design. 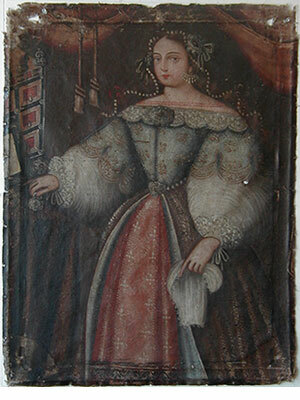 This shows the painting after the slats were removed from the surface of the painting. 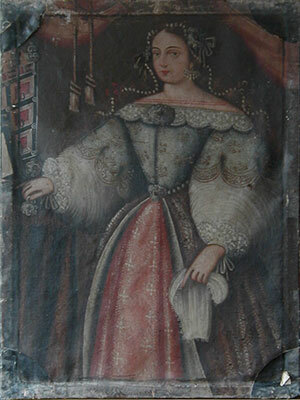 There were also pieces of leather attached to the painting in the corners. The painting here has had the pieces of leather removed, has been cleaned, patched and losses filled and is ready for lining.